COURT EXTENDED – NOW ON SALE UNTIL MARCH 2019! The back row of the stalls is step free as there is a lift from the street to the atrium and a separate lift from the atrium to the chamber (stalls). Step free access from the Jubilee Line at Waterloo Station (9-minute walk) and the Circle and District Lines at Westminster (7-minute walk). Both Westminster and Waterloo Bridges are wheelchair accessible, as are the Golden Jubilee Bridges, connecting the South Bank with Victoria Embankment. 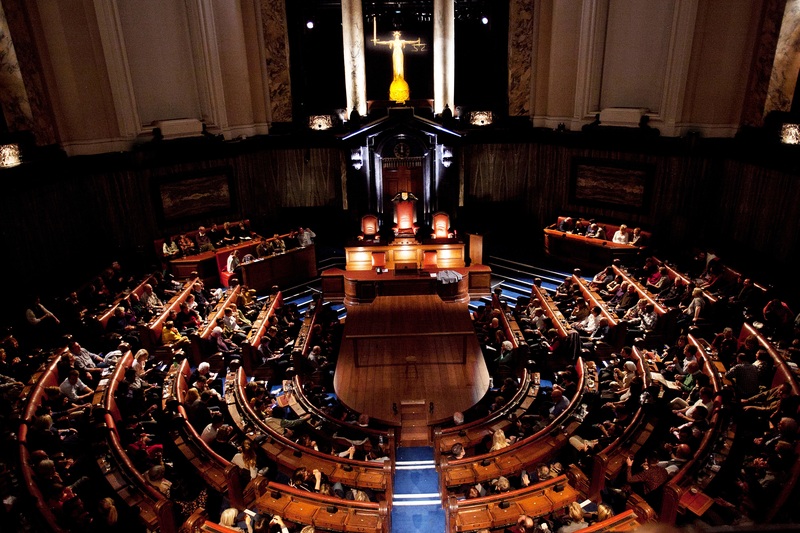 Witness for the Prosecution will be adding some accessible performances – please check their website for more details. There are bars on site which open from an hour before the performance. Witness for the Prosecution have partnered with a fantastic range of suppliers to serve a selection of award-winning ice cream, speciality gin, spirits, wine, prosecco and soft drinks. Independent and family owned Tarquin’s Gin was the Gold medal winner at the World Spirits Competition 2016 and is perfectly complemented by Peter Spanton’s finest mixers, especially in one of our ‘Character Cocktails’. The ice-creams served are from Marshfield Farm near Bath, a family owned farm who use organic milk from their own cows. County Hall was once the centre of London’s city government. This building is located across the river from the Houses of Parliament and served as the headquarters of London County Council and Greater London Council until 1986. According to the Guinness Book of World Records, Agatha Christie is indisputably the best-selling novelist of all time. A 1959 UNESCO report claimed her books had been translated into 103 languages, and she’s sold over two billion copies to date! A relaxing riverside open space, nestled between Oxo Tower and Gabriel's Wharf. The raw, industrial space programmes exhibitions and events, displaying the best in art & design. See shows and exhibitions and take part in our vibrant festivals. Watching a blockbuster at the BFI IMAX, the UK's largest cinema screen. The Oxo Tower has been a Thames-side landmark since the 1930s. During this time, it had many owners including the Liebig Extract of Meat Company who produced the iconic Oxo Cube. After becoming derelict in the 1970s, the building and surrounding land were bought by Coin Street Community Builders and developed into the thriving mixed-use neighbourhood it is today. Who was the real Lady with the Lamp? Travel through three pavilions to relive Florence’s childhood, understand her experiences in the Crimean War and discover how she pioneered modern nursing practice. Her story is brought to life through unique collections, interactive displays and art installations.